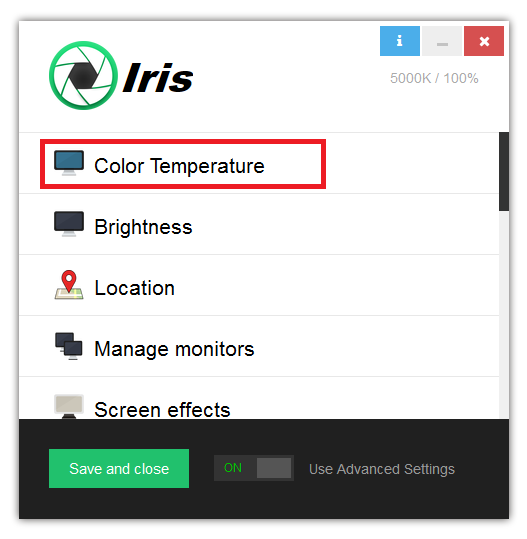 From this page you can customize the amount of blue light emitted from your screen. Basically lower values and less blue light means better sleep and less eye strain. The Day and Night Temperature sliders may seem to have strange values, but for legacy reasons and for users coming from other software I leave them like this. 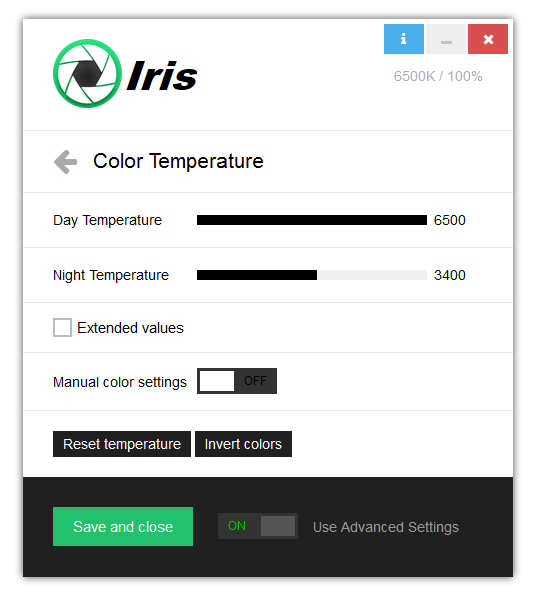 This value is K or Kelvins and it’s the default measure for Color Temperature. Color temperature of 6500 K is no color changes and calibrated display. Day Temperature is the temperature of the display during the day. Night Temperature is the temperature of the display during the night. 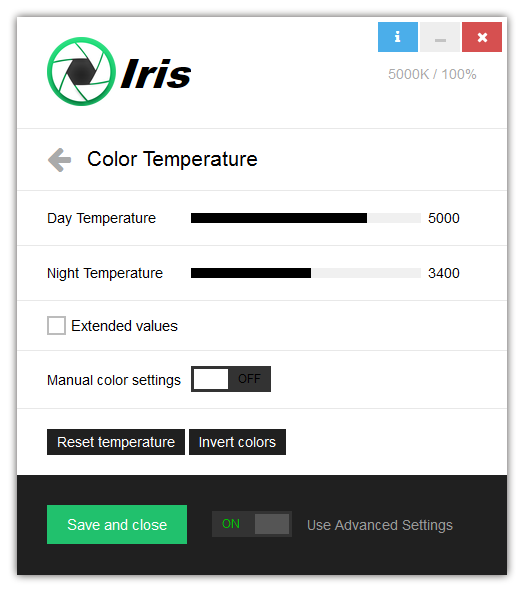 Iris determines if it’s day or night based on your location or on your system clock. Then it does gradual interpolation between the 2 values when the time is right. You can change the default location from the Location page. Extended values will allow you to select values over 6500 K.
Some people use this as some kind of caffeine mode when they don’t want to fall a sleep at night. Values over 6500 K has over the maximum blue light so be careful. This values will not help you fall a sleep faster. I don’t use 10 000K, because my head starts to hurt, but some people use it when they want to put all nighters. 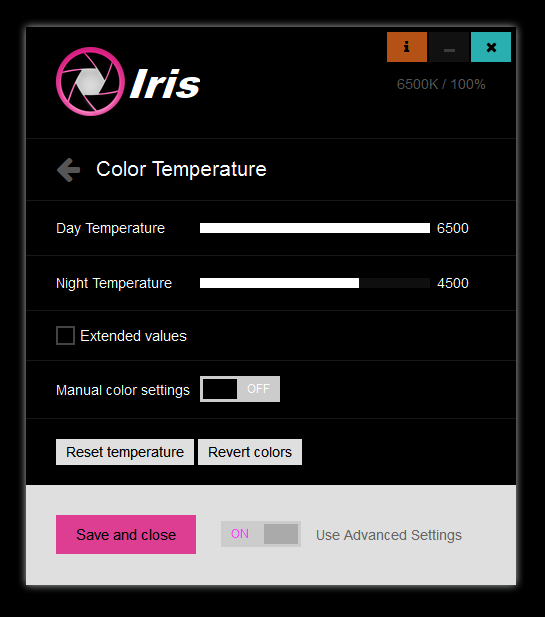 When Manual color settings is set to ON, Night Temperature will be used both during the day and during the night. This way it’s easier to change the temperature fast by hand. This are Up and Down arrow found next to the left to the Enter and right Ctrl key and left to the Num pad. The step is 500 K and the temperature can be set from 0 K to 6500 K. For other values use the sliders. Reset temperature does something which you may think it’s strange, but it’s useful in some situations. 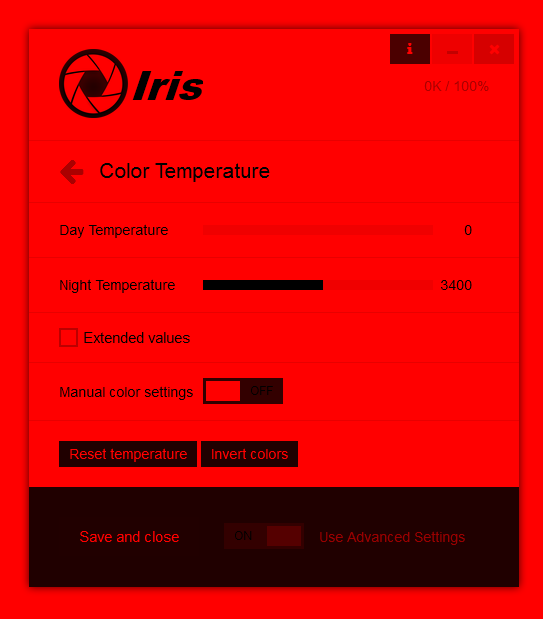 Basically if you killed Iris somehow your screen may be red without Iris running. 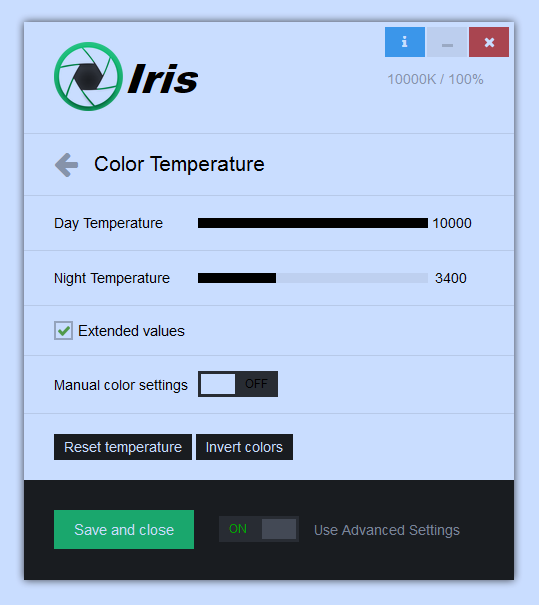 Reset temperature will fix this, but will also remove your display calibration.